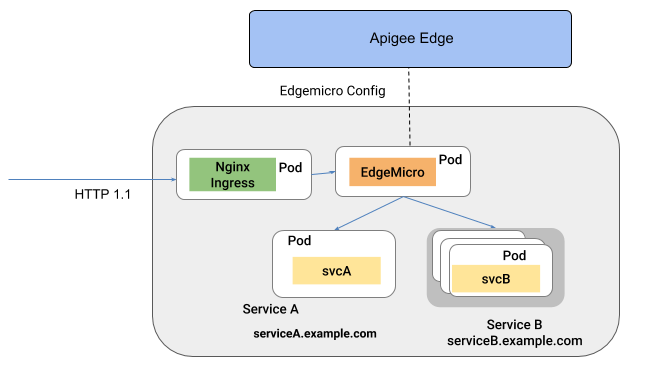 You can use Edge Microgateway to provide Apigee API management for services running in a Kubernetes cluster. 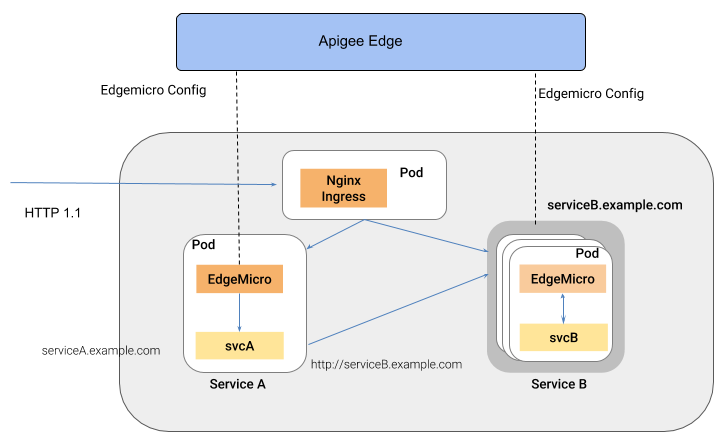 This topic explains why you might want to deploy Edge Microgateway on Kubernetes, and it describes the two main deployment scenarios: sidecar and service deployment. Services deployed to Kubernetes commonly expose APIs, either to external consumers or to other services running within the cluster. How will you secure them? How will you gain insight into traffic patterns, latencies, and errors? How will you publish your APIs so developers can discover and use them? Whether you are migrating existing services and APIs to the Kubernetes stack or are creating new services and APIs, Edge Microgateway helps provide a clean API management experience that includes security, traffic management, analytics, publishing, and more. Sidecar proxy is a common microservices architecture pattern. The sidecar runs in the same pod as the main service, and provides additional services that extend or enhance the main service, such as security, policy enforcement, traffic management, and analytics. The sidecar routes incoming traffic to its main service and routes outgoing traffic to other deployed services or to services outside the cluster. The ability to route calls to services deployed inside the cluster creates a network of deployed services, or a "service mesh." It's interesting to note that the microservices management platform Istio also employs the sidecar architecture. Istio uses an extended version of the Envoy proxy for its sidecar. See Deploy Edge Microgateway as a sidecar proxy. When deployed to Kubernetes as a service, Edge Microgateway runs in its own pod. In this architecture, Edge Microgateway intercepts incoming API calls and routes them to one or more target services running in other pods. In this configuration, Edge Microgateway provides API management features such as security, analytics, traffic management, and policy enforcement to the other services. See Deploy Edge Microgateway as a service in Kubernetes. To learn how to run Edge Microgateway as a sidecar proxy in Kubernetes, see Deploy Edge Microgateway as a sidecar proxy. To learn how to run Edge Microgateway as a service in Kubernetes, see Deploy Edge Microgateway as a service in Kubernetes.